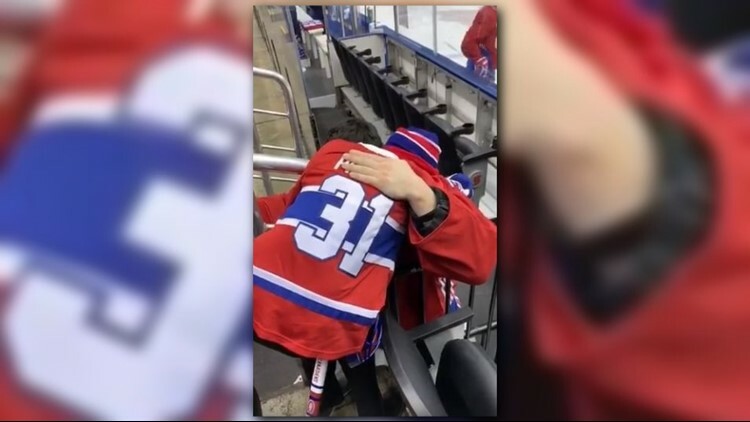 A young hockey superfan mourning the loss of his mother got the experience of a lifetime when his favorite player, Carey Price of the Montreal Canadiens, took a moment to comfort him at a team practice. Eleven-year-old Anderson Whitehead of Ontario, Canada, has been a lifelong Canadiens fan. His dream has always been to meet the team and his favorite player, goalkeeper Carey Price. His mom, Laura McKay, promised him one day she would help him meet the team. She wrote letters and tried to make connections with the Canadiens, but to no avail. Tragically, Anderson’s mom passed away from cancer in November 2018 before a meeting could be arranged. In February, Anderson’s uncle made a connection with a physiotherapist for the team, and arranged for Anderson to watch one of the team’s practices. Anderson was thrilled. He watched from the stands and after the practice was over, the therapist mentioned Anderson’s mom to the team. After hearing of about her passing, Carey Price stopped to sign the young fan’s stick and jersey. It was a moment that meant the world to Anderson. His uncle caught the emotional moment on camera, which has since gone viral on Anderson’s aunt’s Facebook page. The moment Carey approached the group, Anderson broke out in tears. Carey gave him a hug and comforted him as he cried into the goalkeeper’s shoulder. When 11-year-old hockey fan Anderson Whitehead met his idol, Carey Price of the Montreal Canadians, the two shared a special moment. He praised the team for their kindness towards his son. “That meant so much to him,” he said. “We never thought this would happen but so glad to share this heartwarming story,” his aunt, Tammy Whitehead, said about the video. The moment was a special way to honor Laura. Anderson knew it would have meant a lot to his mom. He said he was "relieved" that her dream could finally happen. “She would be very happy for me,” he said.